In this work, we propose a new distance measure for comparing two protein structures based on their contact map representations. 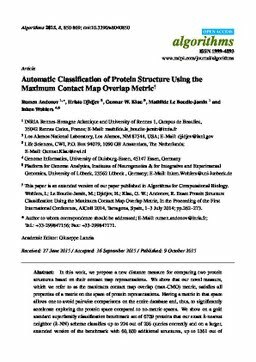 We show that our novel measure, which we refer to as the maximum contact map overlap (max-CMO) metric, satisfies all properties of a metric on the space of protein representations. Having a metric in that space allows one to avoid pairwise comparisons on the entire database and, thus, to significantly accelerate exploring the protein space compared to no-metric spaces. We show on a gold standard superfamily classification benchmark set of 6759 proteins that our exact k-nearest neighbor (k-NN) scheme classifies up to 224 out of 236 queries correctly and on a larger, extended version of the benchmark with 60; 850 additional structures, up to 1361 out of 1369 queries. Our k-NN classification thus provides a promising approach for the automatic classification of protein structures based on flexible contact map overlap alignments.